Liquid Telecom SA, part of the leading pan-African telecoms group Liquid Telecom, has partnered with The Western Cape Government (WCG) to increase the number of free public Wi-Fi hotspots across the region from 178 to 1,600. This will mean that 6.6 million residents will soon have greater access to public Wi-Fi located at government buildings across the Western Cape. This project forms part of a R3 billion plan to provide broadband connectivity to WCG offices, libraries, schools and clinics, and helps to position the Western Cape region as a leading global digital hub. Western Cape households already have the highest Internet access in the country at 70,8% according to StatsSA (2018). “We have reached our target of full broadband coverage with a total of 1 875 sites, including over 1 200 schools; over 200 libraries and approximately 400 other public facilities. Broadband is a key enabler for our eLearning Game Changer, which aims to enhance teaching and learning using digital technology, focusing in particular on our poorer schools. It also focuses on preparing our learners for the 21st Century world of work and life-long learning. The WCED has invested R253 million towards e-learning in the 2018/ 2019 financial year and over R1.2 billion over a five-year period. During this term, we have refreshed 700 computer labs, delivered over 32 000 devices, created an online portal with 11 000 resources, trained teachers to a point where 70% are improving at eTeaching, and we will invest R1.2 billion into eLearning over the next 5 years,” said Premier Helen Zille. “Today’s announcement is aligned with Liquid Telecom’s vision to ‘Build Africa’s Digital Future’ providing individuals and communities with high speed internet across cities, towns and villages’. 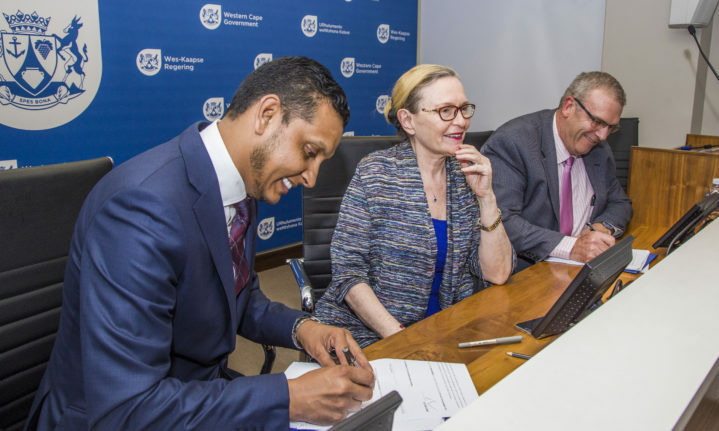 Our partnership with the Western Cape Government is central to this vision – giving every South African the right to be connected with free, reliable and fast internet,” said Reshaad Sha, CEO Liquid Telecom SA. The new expanded public Wi-Fi network will be available across all municipalities and provide 3GB of data per device per month at speeds five times faster than the current service. Government websites will also remain permanently free for users to access, and the country’s cheapest Wi-Fi vouchers for additional data on the network are also still available at selected retailers. Each of the public Wi-Fi hotspots will allow users with Wi-Fi enabled devices including mobile phones, tablets, laptops and desktop computers to connect to the Wi-Fi hotspot without any logins or passwords. The hotspots will be installed over the next 3 years, and the project will run for five years in total. As the cost of mobile broadband is prohibitive for many, particularly rural communities, public access Wi-Fi networks present an opportunity for citizens to connect, not only with each other but, also for employment and business opportunities. This is especially important as many communities rely heavily on mobile phones to stay in touch.